Stop manual processing, faxing and complex data entry practice!!!!!!! Multi Company Purchase Order Software maintains sales/purchase order process to successfully manage the flow of revenue from companies. PO management utility helps business administrative to slash paperwork by automating manual tasks of managing sales and purchase reports. Purchase order management tool facilitates to create and send purchase order invoice report via email to any specified user. 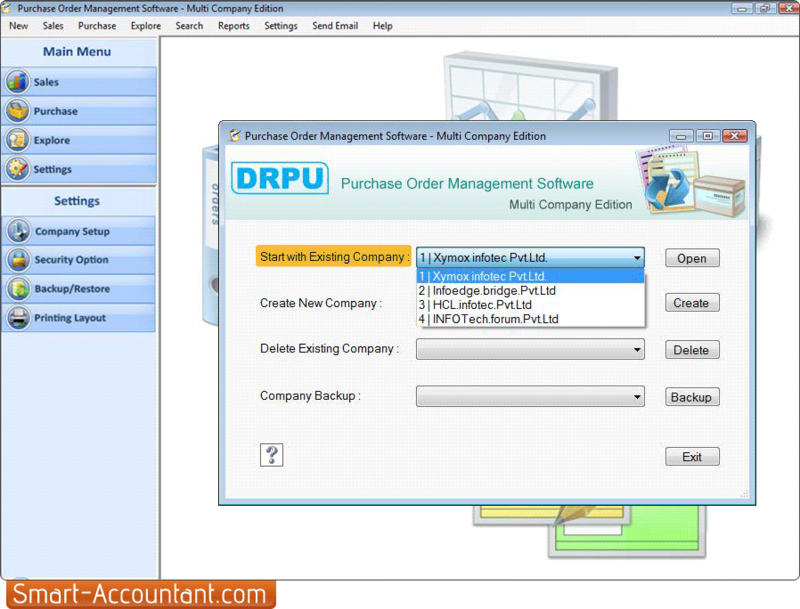 Purchase order organizer software maintains sales and purchase details, customer and vendor balances, financial accounts, inventory stock and various item transaction records. √ Manage sales and purchase records of multiple companies. √ Provides advanced search option to view desired PO records. √ Sales and purchase record backup and restoration feature. √ Password protected settings to restrict unauthorized data modification. √ Send prepared PO reports to suppliers via email settings.